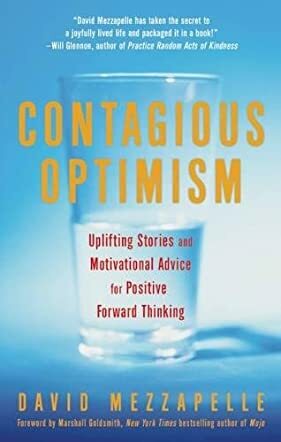 Contagious Optimism: Uplifting Stories and Motivational Advice for Positive Forward Thinking by David Mezzapelle is an inspiring guide for readers who want to bring positive vibes into their lives. It is a book which will give encouragement to those who have and are undergoing turmoil and difficulties in life and want some words of encouragement to uplift them. In a world filled with strife and negativity, there is a lack of confidence in people that affects their aura and behavior. By reading this book, one will be able to make some positive changes in their behavior and life and bring about an openness in thinking habits. I recommend this book to everyone because the optimism is contagious and encouraging. The real stories in the book are fascinating and will help you in changing your perspective on life, empower you and teach you how to exercise control over the mind. The optimism in the stories and the theme is so infectious that it encourages positive thinking. The author's effort in spreading positive energy is remarkable. The book can be used as a guide for making changes in your life. The contents are simple and they deal with everyday topics such as career, goals, health, marriage, talent, relationships etc. The action at the end of each chapter is informative and it captures the essence of the respective chapter in a nutshell. This collection of motivational stories will definitely guide and help readers in making the necessary changes in their lives for positive living.